A majority of the cardiology fellowship rotations are situated at the CRMC campus. The UCSF Fresno training programs and clinical services were transferred from the old University Medical Center to the new state of the art CRMC building in 2007. 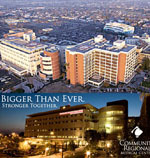 CRMC has over 600 licensed beds, making it the 5th largest hospital in California. Our emergency room has over 100,000 visits each year, the 2nd busiest in the state. We have an active cardiothoracic surgical program which performs over 500 procedures per year. The emergency department has a 10-bed cardiac/critical care pod and the hospital has recently added a new 50-bed cardiovascular unit. CRMC is a primary PCI center with a busy 24 hour cardiac catheterization lab adequately equipped for a variety of diagnostic, interventional, peripheral and electrophysiologic procedures. The cardiac non-invasive lab accommodates a high volume of procedures with a fully staffed echo lab and is equipped with nuclear imaging, cardiac CT capabilities and most recently, cardiac magnetic resonance imaging. CRMC also hosts the cardiology fellowship program’s Outpatient, Heart Failure, Adult Congenital and Pacemaker clinics. Cardiology fellows have a mandatory rotation in Cardiac Transplantation and Cardiac MRI at UCSF Medical Center in San Francisco, consistently named as one of the top 10 hospitals in the nation. During this rotation fellows stay at the “Fresno House,” a furnished apartment near the San Francisco campus rented for the housestaff by the Medical Education Program.